I found drtwofish's post about zoomzoomzoom-ing reuphosltered seats on eBay when I was looking at seats and I went ahead and avoided them! I found a lesser reviewed seller with nothing on r3v and I took a shot. I started by messaging him to get more information about the seats and he quickly gave me his cell phone number so that I could call for more information. He was very eager to answer questions and even agreed to just go through PayPal for a small discount. He ships the seats via Greyhound bus and they were surprisingly quick, it took four days from San Francisco to South Carolina. When I got them home and opened the box I realized that I had received the wrong set of seats. I called him up and he realized that he had misunderstood our conversation and immediately paid me via Paypal to send the seats back. The confusion was that I wanted the reupholstered set and not the really decent OEM set; Even though it had some wear and still had some cracks they were still nicer than the seats I had. Anyway, it took a while to get replacements since he had to reupholster a new set for me. He took the time to deal with all of my annoying check-ins and even sent me pictures along the process. Greyhound took five days this time but I finally received my seats just before my move to NY! The quality of the reupholstering is very nice. There is a noticeable vinyl stickiness compared to the leather but it's not hard to get out of the car. 1) It looks like he accidentally put the passenger top on the driver bottom and vice versa. I was able to get them into the car and the seatbelts working, maybe one day I'll go back and change it but for now it's fine. 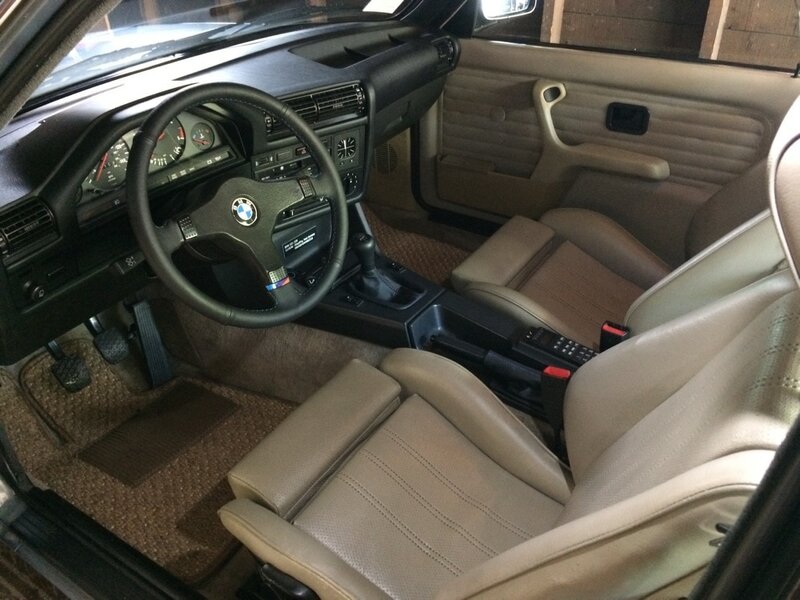 2) The headrests aren't redone - I remember reading this in the eBay ad, and I'm sure if I asked he would have done it but having good original headrests that match well are okay. Maybe ask for recovered ones if you decide to do it and you're particular like me. I highly recommend this stand up guy. I was really impressed with the product and the service. I was really expecting a nightmare when I opened up the wrong seats but he went well out of his way to fix that problem. Hey, I now have rear seat headrests too! Now I can put the dog hammock and take the pupper for a ride! Here are some pics - definitely a great upgrade!! I would highly recommend this seller recommend! Looks good and seems seller is a stand up guy. Waiting on more pics after leather has tightened. I'll try to remember to post updates - shoot me a pm if I don't and I'll get myself to do it! Court I think he said vinyl but is it usual for skins to "shrink to fit" like my new rear vinyl window is supposed to ? Fronts look nice but those rears could use significant improvement... Might have just been the install but those pulls in the center sections are bad. To say the least he didn't do the same for me. Last edited by Chrisbike; 03-06-2017 at 10:50 PM. Reason: Keeping it confidential until I work things out with him. I've talked to this guy before. I'm not 100% convinced the quality matches the price. Are you the seats actually rebuilt mechanically like he says? No, all my shocks were blown, cables were OK. I know that seller, and have bought a re-manufactured drivers comfort seat, a set of basket weaves, and then a pair of front sport seats matched to my aged pearl beige. Full disclosure, I've recommended him to other folks because of the work he did for me and how few e30 seat specialists there are out there who ship and work remotely like he does. Sorry if you think you had a bad experience. Hope you work it out. He went out of his way for me several times. Well too my surprise he contacted me this morning letting me know that he was going to ship out a set of reupholstered seat backs. These were grey seats and the backs were painted and dark gray and that didn't fly with me. Hi Chris, glad to hear you are getting a replacement and it's very fair of you to update the thread. These are my sport seats I got from him - pearl beige. It's not the best shot of the entire seat, it's a cockpit shot from my iphone but it shows the idea. Definitely a great thread. I've been planning on buying from him, but had some questions and doubts. Thanks for all the info fellas.